SONATA Alumni (L-R): Someari Benson JaJa, Effie Mydell, Leah Nestor, Ida Benson JaJa and Ashia Miller. 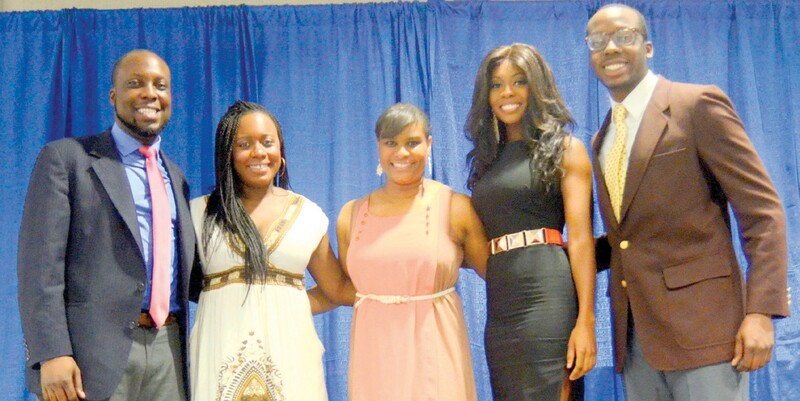 Sponsors of New and Talented Artist Inc. (SONATA) held their Annual Scholarship Luncheon on June 14, 2014 at Savannah State University, New Student Center. The Luncheon theme was “Celebrating Our Past, Composing Our Future”. The event included a silent auction, raffle, prizes and a delectable meal. This year SONATA alumni students organized the luncheon program for the celebration of the students, present and past. The event started with the Mistress of Ceremony, Kim Gusby from WSAV addressing the crowd. The National Anthem was performed by SONATA Wind Ensemble Students; Gayjalyn Gilliam, Principal Alto Saxophone; Nicole Brower, Bass Clarinet; Nicholas Lark, Alto Saxophone and Jalaine Mincey Alto Saxophone. The performance was outstanding! The Invocation and blessing was done by Pastor Aaron M. James Sr. of the Historic First Bryan Baptist Church. The audience enjoyed a fabulous meal while listening to the sounds of the “Here and Now” Band with several songs sung by Bless Loadholt. The entertainment began with SONATA Students performing and alumni spotlight videos. The audience got a chance to see the great progress of Monica Small and Effie Mydell, teacher, Violin; Nathaniel Lanier, Tuba; Soraya Brooker, Viola; Janielle Hannon, Piano and the Wind Ensemble. One of the highlights of the evening was video presentations by SONATA alumni students Effie Mydell, Diana Lugemwa, Joseph Williams, Ashia Miller, Ishmaiel Curtis, Leah Nestor and Someari Benson JaJa. The SONATA board members and audience enjoyed hearing about the alumni accomplishments and their personal testimonies of how being a part of SONATA helped shaped their professional careers. During the Luncheon SONATA honored some local musicians and loyal supporters; Kristi Adams-Distinguished Service Award; Eric Jones-Local Musician of the Year; Michael Hutchinson Local Educator of the year and Teddy Adams-Ben Tucker Lifetime Achievement Award. The president, Lillian Ellis gave an emotional tribute and Distinguished Service Award to the family members of the late Alma Williams, one of the co-founders of SONATA, formerly of Dollars for Scholars. She also welcomed some new members to the board; Teddy Adams, Professional Trombonist/ Musician; Someari Benson JaJa, SONATA alumna, teacher and Music Teacher at Gadson Elementary School; Elaine Campbell, Internal Director at Savannah State University; Kim Gusby, Anchor/ Reporter WSAV; Leah Hannon, SONATA Alumna, teacher and Music Teacher at Savannah Country Day School; Dawn Howard, vocalist, Front House Manager for Savannah Music Festival; Mary Nwosu, Nutritionist Consultant; Shameka Smalls, Technology Support Specialist at Savannah Chatham County Public School System; James Thompson, Retired Band Teacher at Savannah High School and Dr. Blenda Wilson, Retired College President. SONATAS is gearing up for 2014-2015 year and are accepting any donations to provide scholarships to deserving students for classical music lessons. Please visit our website at sonatasavannah.org to learn more about the organization and make donations. SONATA would like to thank all of their loyal supporters that have contributed to the success of this organization!